Ham and cheese is sort of like peanut butter and jelly. They’re one of those combos in life that always works and almost everyone can agree on loving. Whether it’s a sandwich, a croissant, an omelet, a slider or whatever else you can think of, ham and cheese is a much loved combo. This dish is no exception. 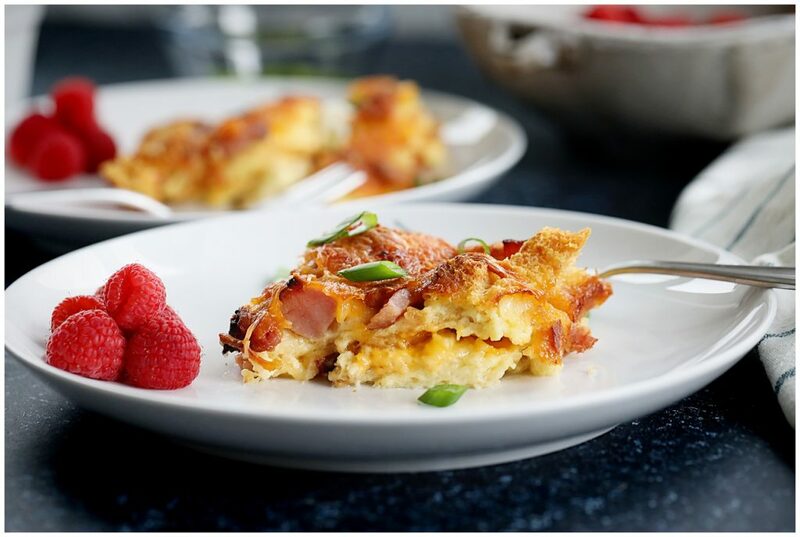 This Ham and Cheese Breakfast Strata combines this lovely duo and takes it to the next level. 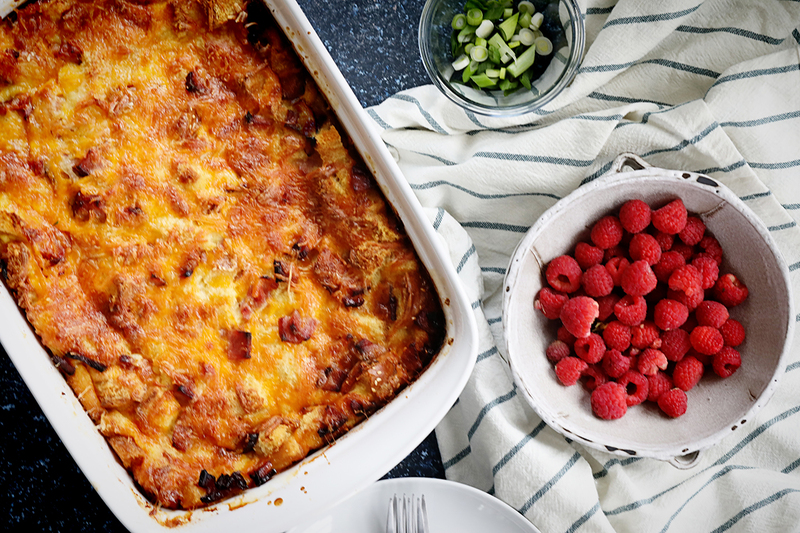 Combined with savory eggs and bread, this casserole dish is one you will remember. If you’ve never heard of a strata before it’s simply a fancy way of saying a layered casserole dish. It is considered an American dish and is similar in make up to a quiche or a frittata. One of the best parts is that it – like a quiche – it can actually include anything you want it to and variations abound. 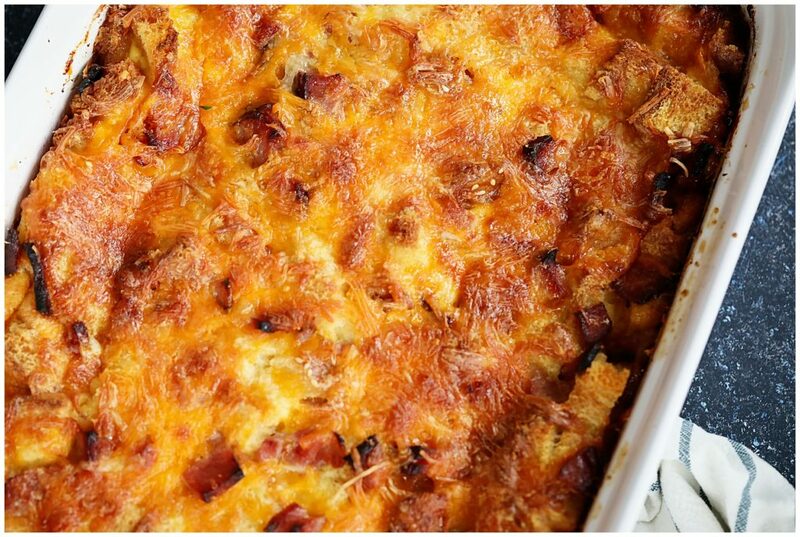 With this simple Ham & Cheese strata you could easily toss in some green peppers, spinach, broccoli or even kale. Red peppers, tomatoes, onions or even asparagus would go nicely too. 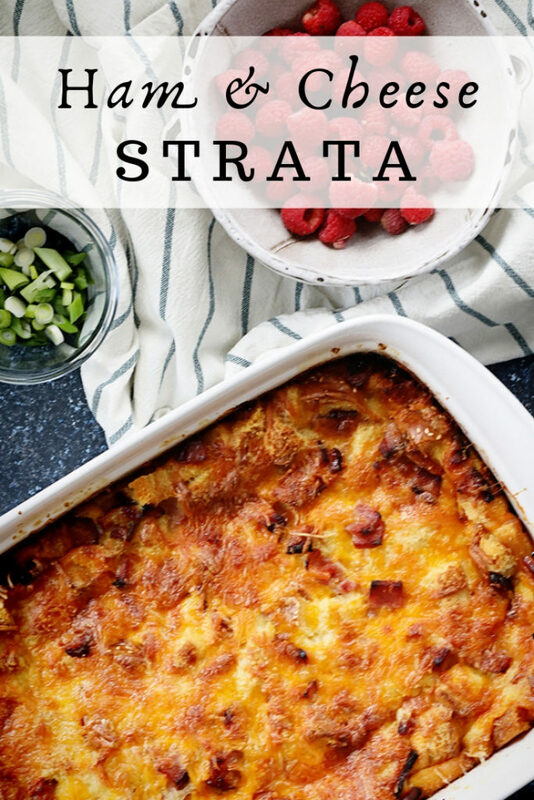 This strata is usually served for breakfast or brunch. It’s perfect for celebrations like Easter, Mother’s Day, Christmas morning and New Year’s morning. Add some fresh fruit on the side and you have a simple morning dish that feeds a group of people. Or pair it with a salad and serve it for lunch. It reheats well too so if you have leftovers you can save it for a few days. Grab the full, simple recipe below and let me know if you decide to make it! For more breakfast recipes, click here. Grease your pan with your olive oil and make sure the whole pan is covered. Layer about half of your bread cubes on the bottom on the pan. Next layer half of the ham and half of the cheese. Add in the rest of your bread. Then add another layer of ham and cheese. Combine milk, eggs and melted butter and then pour it over the whole mixture. Make sure to cover the whole casserole with the mixture. Chill for at least two hours. If you want you can make this the night before you intend to serve it. Preheat your oven to 350 and then bake for 40-50 minutes. Let cool for about 5 minutes and then serve. Ooo I know I would love this! What a great breakfast. I’ll have to make this with leftover ham for sure. We always have leftover ham. I wish I would have made that this morning! Definitely going to make it this weekend for the kids. This is such a great post-Easter breakfast. I’m always trying to think of things to do with leftover ham! This looks so yummy. It would be perfect to make for my next brunch. I know my guest would love this. This looks and sounds so good!! I love savory casseroles like this! Perfect for an Easter brunch! 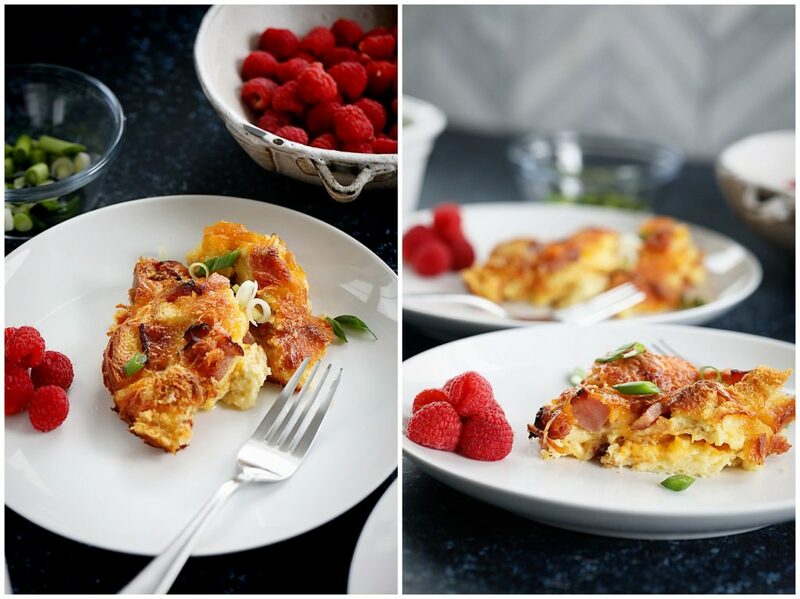 I love the idea of a breakfast casserole. I bet a lot of people with be making this for the upcoming Holiday weekend. I could really go for this! Ham and cheese are two of my favorites. Add those two together I’m in heaven! Yum. I’m in charge of bringing something for Easter brunch and this would be perfect. I am always searching for something last minute but you save me this year! No more searching, this looks delicious. This sounds like a great breakfast! I am sure my entire family would wolf this down in a heartbeat! That recipe looks so amazing. I will have to add this to my list of recipes to make. I can’t wait to try it. It sounds so good. This looks delicious. I haven’t made a strata before. I know I have been missing out. I can’t wait to make this. Now I know what I will make for weekend brunch! 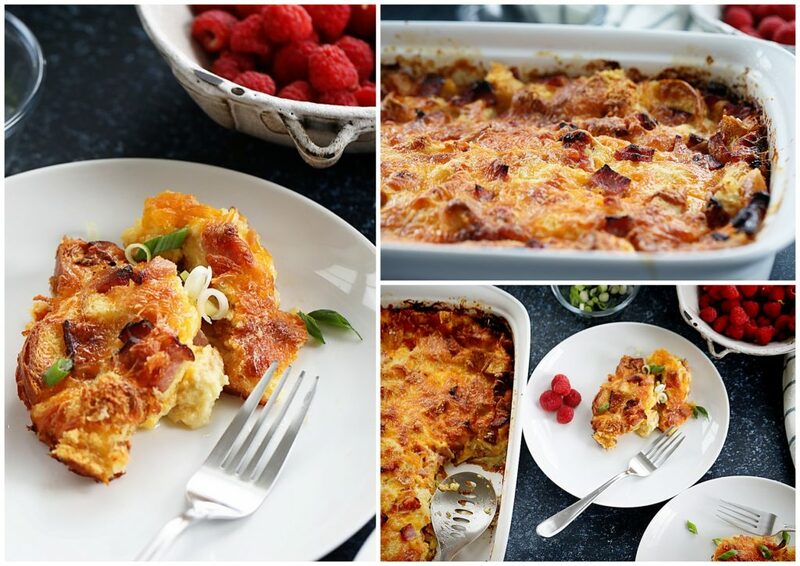 I am sure that all my family will love this breakfast strata! I’d happily eat this for breakfast any day of the week! That breakfast looks fantastic! I love how cheesy it is! 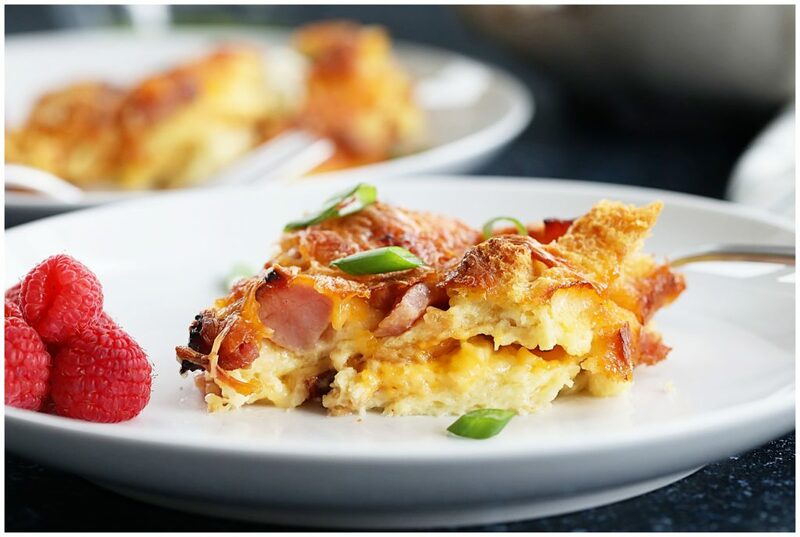 I absolutely love breakfast casseroles, and this one looks delish! I love brunch recipes! I always cook egg and ham for my family! 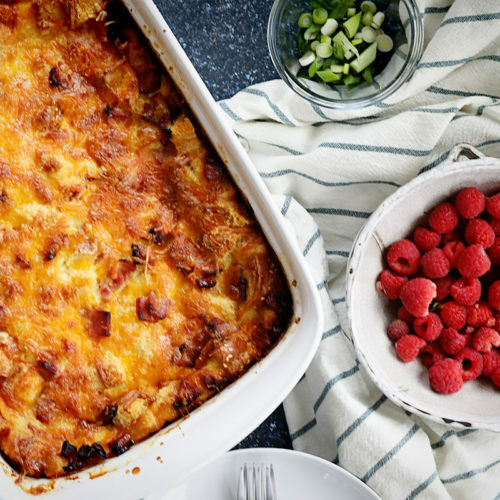 This casserole looks delish! How delicious. Love anything with Monterey Jack!! This looks delicious! I’m not much of a morning person, but I would get out of bed at any time for this! This sounds amazing! I love breakfast bakes. this would be perfect for brunch with the family. Oh yum!! This looks delicious. I would totally eat this. Maybe, I should just make it 🙂 Thanks for the recipe. Wow, this recipe looks so good. Perfect and just in time for Easter!